Picture yourself at a movie premiere. What do you see? The lights, the camera, the red carpets, the stars and the thing behind it all: the step and repeat backdrop. 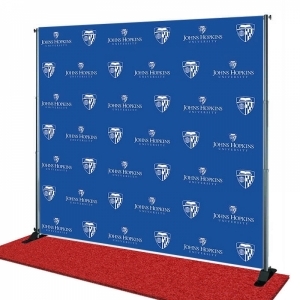 Perfect for formal black tie affairs, the step and repeat backdrop has been a staple of all red carpet events. A custom Step and Repeat Backdrop Banner is a great way to make your event memorable. The Custom Step and Repeat backdrop can help you create the perfect photos set up like a Hollywood star. You can promote your business, show appreciation to your sponsors; take your event to the next level! 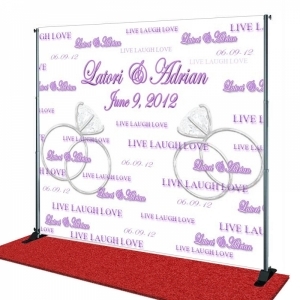 Our Step and Repeat Backdrop is matte-finished which helps to reduce the glare from photos. Although you see the step and repeat backdrops at formal red carpet events, that does not mean it is limited to just that. Our Custom Step and Repeat Backdrop Banners are perfect for all kinds of events whether it’s for a wedding, birthday, graduation party. Our Custom Step and Repeat Banner can be customized to any arrangement. Create a photo backdrop that you can use to commemorate the event and create lasting photos that you can keep for a lifetime.